There exist different ways of solving this problem: use of more wide-angled lenses or lenses with aspheric optics; applying zoom function (drawing closer) instead of approaching the captured objects. But the most convenient way of correcting distortion is doing it with software. In Altami Studio the possibility of correcting the distortion of images is developed. Correcting lines at the photo is made taking into account inner (own) parameters of camera (relation of screen sides, focal distance, etc) applied by capture in the given conditions. Aligning the image in the application is carried out easily and quickly: it is enough only to calibrate the photo, and after that to apply the given calibration to other images. 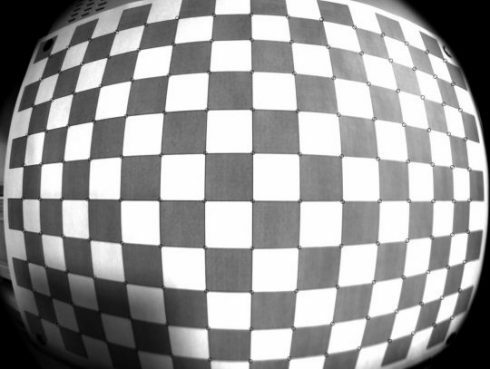 In order to make calibration, one needs to photograph the used by camera object which has horizontal and vertical lines (for example, checkerboard having proper squares). Then it is necessary to fix at the image control points with the help of the figure of Point program (control points at the checkerboard should be at the corners of squares as it is shown in the picture). The application unwraps the image and aligns distorted lines, saving intrinsic parameters of the camera into filter. By that on resulting, corrected image of the checkerboard one can check the effectiveness of correction which depends on how accurately control points at the photo are set. After that operation the filter can be applied to other photos made by this camera, and distortion of images shall be automatically eliminated.